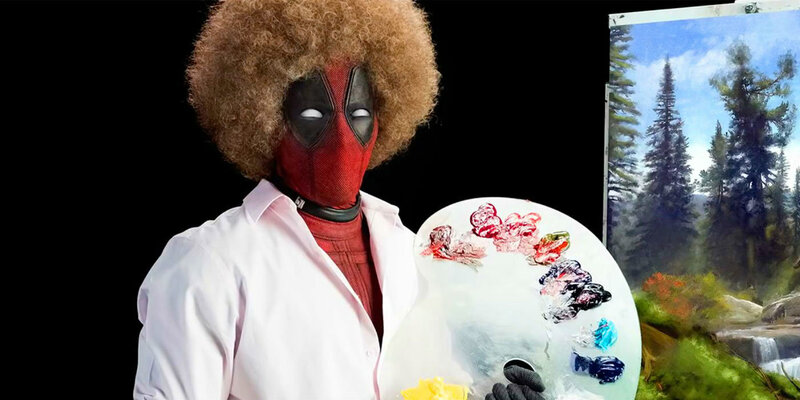 The new teaser trailer for Deadpool 2 may be a love letter to Bob Ross, but there are plenty of Marvel details and X-Men clues hidden in the footage for fans to catch. The footage of the actual movie - which may or may not actually be called Deadpool 2 - lasts only a few seconds, but going shot-by-shot offers up plenty for fans to speculate on, celebrate, or laugh at some truly inside jokes. To make sure that the fans of Deadpool, Cable, Domino, and even the mystery villain of Deadpool 2 don't miss out on a single detail, we're breaking them all down. So without further ado, and with a clear warning that some potential SPOILERS may lie ahead, let's get to it. Look, it may be our desire to see Ryan Reynolds's Deadpool and Hugh Jackman's Wolverine at work (again), but it's hard to imagine any piece of Deadpool marketing that chooses NOT to take a shot at the clawed, super-healing mutant with a famously bad attitude. After the first movie took more than one shot at Jackman - first suggesting that Deadpool performed sexual favors with Fox's biggest X-Men star to get his own movie made, then stapling a photo of the Aussie's face to his own scarred visage - the pair's link was established. No, Wolverine doesn't appear in the Deadpool 2 teaser in either explicit or concealed form. But Wade Wilson's decision to start off his painting by painting the sky a brilliant shade of yellow seems a little strange... until you remember most of the posters used to market Logan, Fox's most recent R-Rated entry in the X-Men universe. A truly subtle reference to the marketing department's idea of giving Wolverine's final movie a yellow sky aesthetic? We'll take it. There isn't too much we're able (or willing) to pull out of the choice of landscapes being painted by Deadpool in between shots, since a picturesque cottage could mean any number of locations in both his and Wolverine's history. But it's the shift from Bob Ross homage to actual trailer that has our attention. More specifically, what suddenly appears on the canvas before Wade tosses his paint palette in surprise and blows the segment. Especially since it appears that he didn't paint it at all, exploding in shock when he sets eyes on the design, and beginning to back away. The image may seem like random paint splotches, but break it down: a large section of red in what looks to be the shape of shoulders and a head. Then within that field of red, a smaller circle - a head, perhaps? - marked with two black eyes, and a splash of white. Some might have read the image as Deadpool's mask at first glance, but it's a poor match. 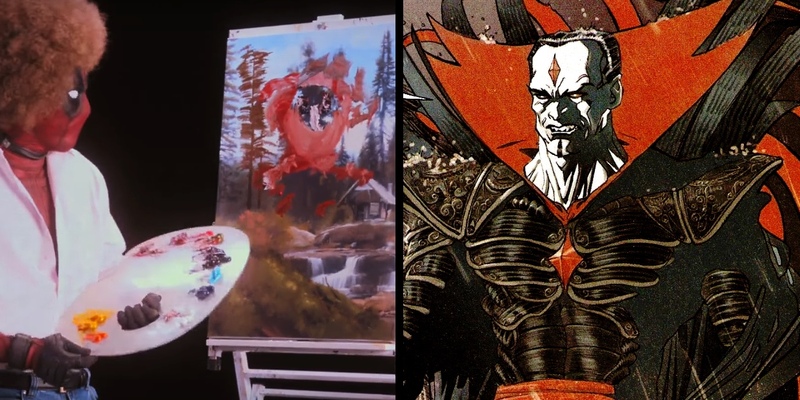 Imagine that red is actually a cape wrapped around and behind the head within, though, and it's a subtle-but-noticable rendition of Mister Sinister. Also known as Nathan Essex, he's been hinted at in the most recent X-Men films, and has a MAJOR connection to Cable (he created him). Since Sinister's story hinges on time travel, and Ryan Reynolds has teased time travel for Deadpool 2, we think we might be onto something. It wouldn't be a trailer for Deadpool (or any superhero movie these days, to be honest) without some pyrotechnics and exploding set pieces. And what's the only thing that can make a Marvel explosion better? Easy: a mutant prison break. At least that's what the scene appears to include, based on the guards wrestling with people in yellow jumpsuits, and that the explosions are shattering what look to be plastic containment cells. Which means fans have some theories to spin right off the bat.